This was a dicey proposition from the press release alone. The exact wording that left me feeling uneasy was “it is a concept album made up of one epic 40-minute song”. What the heck? Did the Insomnium guys get confused and show up to Moonsorrow’s rehearsal space, shrug their shoulders and say “Screw it!”? This was such uncharted territory for a band who despite delivering consistently cohesive albums on a sonic and lyrical level (in aesthetic values at the least), is not exactly known for writing full blown, narrative-driven concept albums. 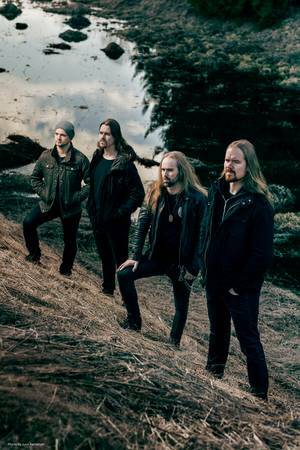 Insomnium has always operated in a broad, expansive thematic field, their lyrical subject matter able to deftly shift between plainly written outpourings of introverted despair or the usage of folk allegory and natural imagery to communicate an intensely personal feeling. Their best album, 2011’s One For Sorrow, was a shifting, undulating collection of light and shade, moods and temperaments across a collection of songs about the memory of loss and the ache of loneliness. But this new album Winter’s Gate, their seventh overall, is based on a short story by vocalist/bassist Niilo Sevänen about a band of vikings that set out to discover a fabled island west of Ireland as winter approaches. Word is that Sevänen actually won a few literary awards for the original Finnish version of the short story, so its got some literary academia cred behind it. But even the finest storytelling won’t amount to much in the context of a metal album if the music doesn’t pull you in, let alone a singular forty minute track… and on that note, a bit of clarity is needed. I’m not sure how all of you are consuming this album, but I got two copies —- somehow I landed a promo invite for this album thanks to a kind PR rep despite not being a regular for Century Media releases, and then my deluxe edition book arrived in the mail. So here’s the thing, on the physical edition of Winter’s Gate you get the album as one track at 40:02 in length, no cuts or segmentation at all —- yeeesh. However, on the promo copy, the album is divided up into chapters (titled “Winter’s Gate Pt. 1” and onwards through seven). This was curious, so I did some looking around and it turns out that perhaps the band or label was forced to make some cuts for the digital release of this album, and I wonder if its due to track length limitations on these various platforms such as iTunes or Spotify (perhaps caching such a long song is a problem?). Notice that audiobooks sold over iTunes are heavily segmented, even massive ones like The Silmarillion or the Game of Thrones stuff (maybe I’m way off on that theory, just speculating). What’s clear is that the band preferred to have this album consumed as one long, singular track ala Crimson by Edge of Sanity, their admitted inspiration for its structure (and perhaps not coincidentally, Dan Swano handles the mixing of this album!). As for myself, faced with two options in listening experiences, I opted for convenience’s sake and went with the segmented digital copy. Firstly it would help me because often times in reviewing I’ll play the album straight through, and then go through it again in reverse order just to see if my opinion isn’t being strongly influenced by the first couple tracks (a long standing practice that isn’t talked about much publicly was/is to front load an album with what’s considered the best material and thus get the over burdened rock/metal press to peg glowing reviews, however skewed —- see Sepultura’s Roots). Anyway, that being the case, you might find it frustrating that I refer to particular sections of “Winter’s Gate” by the chapter instead of marking the time that you’d find in the 40:02 single player. I apologize in advance for that, but I do actually wish they’d sliced this up on the physical release a bit. I get why they chose not to, but if I only had the physical copy to play or rip to my laptop, it’d be a frustrating thing for me to get to my favorite chapter of the album, or a particularly awesome moment I really wanted to hear right then. That is a criticism I’m leveling at the band right away, because I applaud ambition (even if a forty minute song on paper sounds dreadful) and I love the guts it took to do something daring like this album when it could so easily backfire —- but a little detail like slicing the piece into skip-able sections shouldn’t be viewed as a concession to low attention spans in the iPod age, but simply as a considerate feature for your passionate fans. 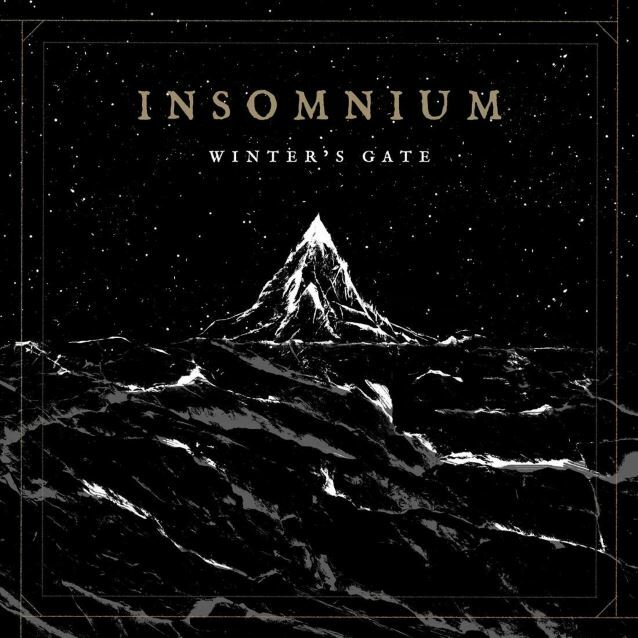 I’m happy to say that all my fears about what this album could have sounded like are allayed, and in fact, Winter’s Gate might just be Insomnium’s most gripping, powerful piece of music to date. It’d be pure speculation to suggest that it was a purposeful internal reaction to the somewhat mixed reception of 2014’s Shadows Of A Dying Sun, but it sounds like a band having a sense of urgency about their art. That idea of urgency is most vividly heard in the increase of raw brutality that streaks across the album like that bear’s paws across Leo’s back in The Revenant, barreling at us in the form of harsher, more guttural vocals by Sevänen, and a surprising second wave of Norwegian black metal injection that courses through much of this material. That particular facet begins straight away, where blastbeats and furious tremolo riffing combine in a violent musical bed over which more traditional Insomnium-esque lead guitar melodies spiral upon at a slightly slower tempo. In other words, its a merging of Finnish melo-death mournful melody and Norwegian black metal hypnosis into something truly unique, and you’ve never heard Insomnium sound this heavy or impactful before. Its a satisfying combo, particularly when they add in flourishes of Gothenburg, or let’s be more specific, Jesper Stromblad-ian speed-picking riff flurries as a just-as-frenetic yet lighter shade to the black metal furor. My first playthrough of the album had me grinning like an idiot only a few minutes in “Winter’s Gate Pt. 2”. And it was right around that time where we are treated to our first tastes of a more recognizable, classic Insomnium sound (approximately 8:43 for you folks with the single track), with guitarists Ville Friman and Markus Vanhala abruptly shifting away from a staggeringly brutal passage into a flowing, beautifully written, lilting open chord sequenced solo over chiming acoustic guitar. We also get our first dose of Friman’s excellent clean vocals, suitably downcast in tone but still built on tuneful melodies and helped along by his perfect enunciation that pairs well with only the slightest tinge of an accent. This chapter ends with swirling, long guitar sustains, like leaves stirred up by gusts of autumnal winds, quietly falling into a hush from which rises “Winter’s Gate Pt.3” (at the 12:52 mark). This section really reminded me of Porcupine Tree, not only for the syncopated rhythm section with playfully bouncy bass and dancing guitar lines, but for the paintbrush strokes of keyboard generated atmospherics that move in and out of audible range like waves lapping a shoreline. Vanhala has mentioned in interviews to referring to this chapter’s guitar solo as his “Dire Straits moment”, and its easy to hear why he’s characterizing it as such. It caps off an overall lovely 5:52 minutes of delicate musicality largely built upon progressive rock touchstones and dynamics (I say delicate because even Sevänen’s harsh vocals are a little more subdued when he comes back in towards the end). Its not only a welcome musical interlude that is engaging and oddly comforting, but it sets up my favorite moment of the album in “Winter’s Gate Pt.4” (begins at the 18:45 mark). Friman has steadily been growing in confidence as a clean vocalist since his work on One For Sorrow, with his largest leaps marking some of Shadows of a Dying Sun’s finest moments (“Lose To Night”), and on this particular chapter he fully realizes his potential. His clean vocals during this section range from Mikael Akerfeldt earthiness in the beginning of the chapter (“Still I bear the flowers…”) to near Pink Floydian epic layering towards the chapter’s emotional crescendo (“I walk with my head down…”). Listen to this chapter with headphones, because there’s some impressive acoustic guitar work going on underneath all the heavy layers of riffs and aggressive vocals that absolutely needs to be heard. I also love the sombre, twilight conjuring use of piano to mark the beginning of “Winter’s Gate Pt.5”, as the instrument is an Insomnium staple at this point and it’d be strange not to hear it. What it introduces is the march towards some of the most dark, intensely heavy music the band has ever done —- cue up 29:36 where a classic Insomnium bittersweet melody unfurls into a blisteringly fierce section, Sevänen’s vocals delving down into previously unheard death-doom territory over tremolo riff sequences. By the time we reach the concluding “Winter’s Gate Pt.7”, we’re somehow still not ready for the sheer violence that the band plunges you ear first in (specifically at the 34:31 mark), with Sevänen’s vocals exhanging guttural death-metal for the coarse, wind-strained harsh black metal barking more associated with Enslaved’s Grutle Kjellson. If you’re following along with the lyrics and the storyline in general, this is around the time when it all hits the fan for our viking friends, but even if you’re not, the urgency and sense of madness conveyed by this awesome, eye-opening sequence is certainly heart pounding. The guitar work is inspired and tremendous, and the implementation of tremolo riffing isn’t a gimmick, it really does have a way of getting your hackles up as a listener —- funny how so many black metal bands never learned that tremolo picked passages work best when used alongside tempo accelerations and shifts and counterpoints… a melo-death band from Finland seems to understand that intuitively. If you want another example of tremolo passages being used in non-black metal music to powerful effect, check out Sweden’s own Falconer on their Armod album. Something we should consider on the guitar front is Vanhala’s longer period of time within the lineup, he is in fact a co-songwriter all through the album, contributing to the music alongside Friman and Sevänen. Friman used to handle most of the music by himself, but he seemed stretched thin in spots for Shadows with some notable exceptions. I wonder if Vanhala’s integration in the music writing was the catalyst for injecting some much needed change with the way the guitar riffs and passages were envisioned and written (Vanhala is the primary songwriter for Omnium Gatherum whose music is considerably more uptempo and frenetic than Insomnium’s… well, until now perhaps). I’m absolutely thrilled that Insomnium pulled off the improbable here, and dare I suggest that they’ve made one of the most complete albums of the year. Its nicely concise, something I think the band needed after spending a decade in 55 minute plus territory through most of their albums, and despite the single track on the physical release being a significant flaw, the music here is strong enough to lock in most attention spans. 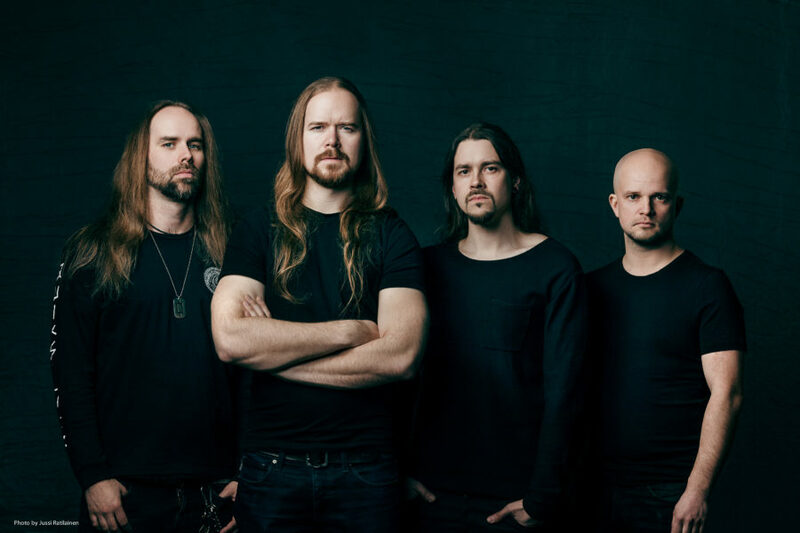 Insomnium are a rather smart, intellectual bunch (check their bios), so credit to them for realizing that they had to shake things up somehow, even if that meant doing so in the riskiest way possible. I believe that when this album first came out, as I iterated to you on Twitter, that I was on the fence on this one. It took around 5-6 consecutive listens for it to sink in, that this could be, for me that is, one of the best Insomnium albums I have ever heard. But, I’ll have to qualify that by saying, One For the Sorrow is their best “conventional” record and this is their best conceptual record(song)… Having nothing else to compare it to, of course. My first couple of listens I was like, this is ok but, something seemed a little off. Production seemed a little fuzzy from what I was used to. So, after listening a few times on the Logitech 5.1, I took to the Beemer’s 13 speaker Harmon to verify that this wasn’t the case. Flawless. Each chapter drew me deeper and deeper into the story as I began to realize what was to befall them. The story was as magnificent as only Insomnium could tell. I felt as if I was part of the adventure. Side note: Be sure your next vehicle purchase is that of which the value of the sound system far outweighs any of the other options. I’m wondering if what you heard as “fuzzy” was actually just the tremolo riffing. It sticks out simply because it is so unorthodox for them. It took me by surprise that’s for sure. Ah yeah good tip on the vehicle, I’ll be thrilled to have a car system with Bluetooth! No doubt that was it once I figured out what they were doing, and the fact my 7 year old Dell is failing. It was definitely easier to pick that out once the X5 concert hall was summoned. I’ve noticed a lot of clarity issues on the ol’ pc since. Actually just read your review and then looked at Angry Metal Guy to find this listed as September’s AOM so I had to give it a listen. The version I’m listening to is on Amazon (music unlimited) and broken up into 7 sections so followed along nicely with your review. On first listen I like this very much though the slight gap between sections on Amazon is enough to break the flow and pull me out – I think I would enjoy much more without the interruptions. That being said I think this is my favorite Insomnium so far. Those slight gaps are still somewhat there on the physical copy, more so because the start of most of these chapters brings some sort of shift or mellowed intro. Yeah I just read the AMG feature myself, good call on their part. I love the album, not sure if it’ll be my fav, time will tell…. One For Sorrow made such an impact on me. Actually just listening to One For Sorrow right now for the first time in a very long time. When it came out, I heard it once and planned to purchase but there were too many albums I wanted at that point that and I never got round to it. Thanks to the new music service on Amazon – I am listening to it now and really enjoying it much more than last time I heard it. Hmm..maybe I need to go back and listen to all their older releases again. Definitely recommend doing so, Across the Dark was another amazing album! I’ve been listening to this repeatedly over the past few days. Really a masterwork of Northern style metal. The sublime blast/lead part which appears first at 3:26 gives me serious shivers. My only objection is the non standard track listing. On streaming services the album is broken up into seven parts, which are very clearly separate pieces. It just looks like they didn’t feel like coming up with song titles 🙂 I also listened to their other acclaimed work Above the Weeping World a few times, and it’s solid but definitely not as good. Any other recommendations for tremolo-style riffs in a melodic context, aside from the great Falconer, MP? Yeah the tracklisting split is strange, I’d rather they just did it like the online version. I will say in the booklet there are subtitles to these songs, why they’re not listed on the individual digital tracks is a mystery. Great album though, in the running for the end of year list.